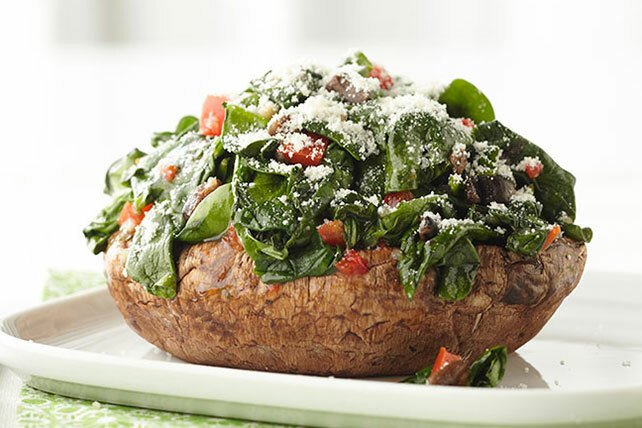 Go meatless with these Spinach-Stuffed Portobello Mushrooms. Healthy Living Spinach-Stuffed Portobello Mushrooms are so impressive, you could serve it to a vegetarian as an entrée or to a carnivore with a steak—and both would approve! Remove stems from mushrooms; chop stems. Use spoon or sharp knife to scrape gills from caps; discard gills. Brush 1 Tbsp. dressing onto rounded sides of caps; place, rounded-sides down, in foil-lined 15x10x1-inch pan. Heat remaining dressing in large saucepan on medium-high heat. Add chopped stems, peppers and garlic; cook and stir 2 min. Add spinach; cover. Simmer on medium-low heat 4 min. or until spinach is wilted, stirring after 2 min. Spoon over mushroom caps; top with cheese. Bake 18 to 20 min. or until mushrooms are tender. For a more golden appearance, prepare and bake recipe as directed. Turn oven to Broil, then broil mushrooms 2 to 3 min. or until cheese is golden brown.